Today’s Verse/Thought: PRAISE-Why Praise First? Yesterday, you determined to set aside the first moments of your time of prayer to speak vocal PRAISES to God. But WHY do we do that? Only praise puts God in His rightful position at the very outset of our praying. In praising God we declare His sovereignty and recognize His nature and power. Through praise we first draw our attention to GOD in prayer BEFORE we draw our attention to SELF. In its very nature, praise is unselfish. It has been said that praise DECENTRALIZES SELF . . . it demands a shift of center from self to God . . . Praise produces forgetfulness of self?and forgetfulness of self is HEALTH. What a concept! Aren’t we all looking for HEALTH in body, mind and spirit? We soon discover SPIRITUAL HEALTH has its ROOTS in DIVINE ADORATION. Therefore, praise is quite PRACTICAL. It is practical because it changes our focus. As we recognize God for all He is, we soon realize it is this ALL-POWERFUL GOD to whom we will be presenting all of our later requests. And last, but not least, opening our prayer time with Praise, promptly SENDS THE DEVIL RUNNING. Adoration is actually the antidote to the poison of satanic oppression. The devil is allergic to praises to God, so where there is massive triumphant praise, the devil is paralyzed, bound, and banished. 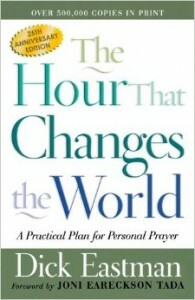 CHOOSE at the outset of your devotional time of prayer to shift your focus off of self and on to God. Do first as the Psalmist does, PRAISE GOD FOR HIS NAME. TELL Him how much you appreciate Him and what He has done for you. To praise God is to prize God. So take a few moments to PRIZE the name of Jesus Christ with words of praise? Lord Jesus, I praise You. You are so wonderful. I praise you for all that You are. I praise You that Your Name is the greatest . .
RECOGNIZING that God is our standard for righteousness, praise Him for His RIGHTEOUSNESS. Righteous means meeting the standards of what is right and just. You will come to find that it actually becomes a relief as we come to DEPEND upon and FOCUS on His righteousness rather than our own? God, I praise You that You are my righteousness on Whom I can depend . . . that You never shift or change . . .